Don't these look yummy? When I made them my daughter shared a couple with her friends and they all wanted more. Even the hubs likes them. Apparently the trick to getting a soft sugar cookie is using cake flour. I just happened to have a box of cake flour (why? I don't know!) that was expiring at the end of this month, so I decided it was time to test the theory. These soft, thick cookies were the result. 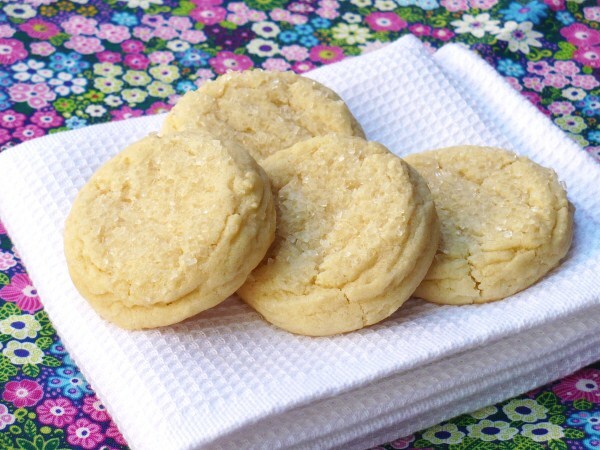 If you don't have cake flour, I have another soft sugar cookie recipe here that doesn't call for it. Cream butter, shortening, and sugar; stir in eggs and extracts. Combine flours, cornstarch, baking powder, and salt; add to butter mixture until thoroughly combined. Cover bowl with plastic wrap and chill dough for 30 minutes. Preheat oven to 350 degrees and line cookie sheets with parchment or Silpat. Roll dough into 1 1/2-inch balls (or use a med-sized cookie scoop) and dip or roll in coarse sugar. Place 2 inches apart on prepared cookie sheet. Return dough to fridge between batches. Bake for 8-9 minutes or just until bottoms start to lightly brown. Remove from oven and slightly flatten cookies with a spatula. Let cool on cookie sheet 3 minutes before removing to wire rack. Makes 3 dozen cookies. If you want to make larger cookies, you will need to adjust your bake time about 1-2 minutes.